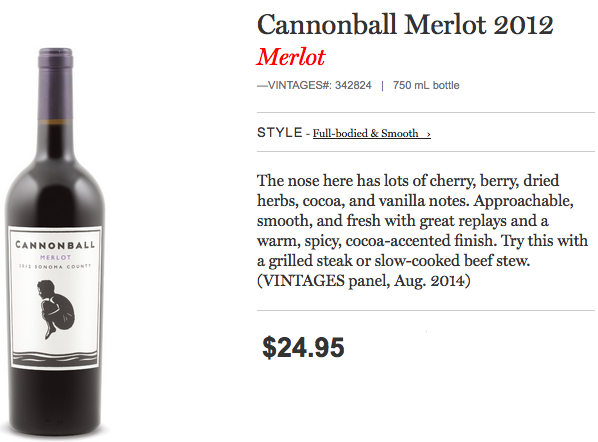 Cannonball Wine Company makes a big splash with their 2012 Cannonball Merlot! Talking about Merlot Madness! Our next guest really makes a splash and dives right in with his line of wines appropriately called “Cannonball”. Remember when you were a kid with not a care in the world? Jumping in the pool, making a huge splash, just pure fun and enjoyment, really loving life? So that right there is the Cannonball Wine Company philosophy. Not taking themselves too seriously although serious about making great quality and super value wine, including their Sonoma County Cannonball Merlot! 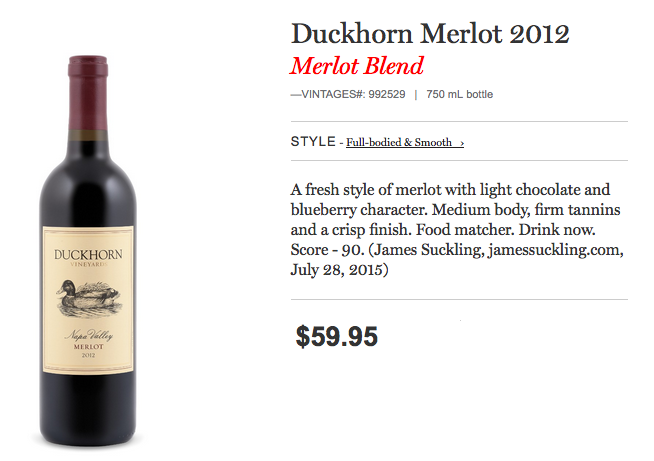 Calling all Merlot wine skeptics out there and all you Merlot wine lovers alike! 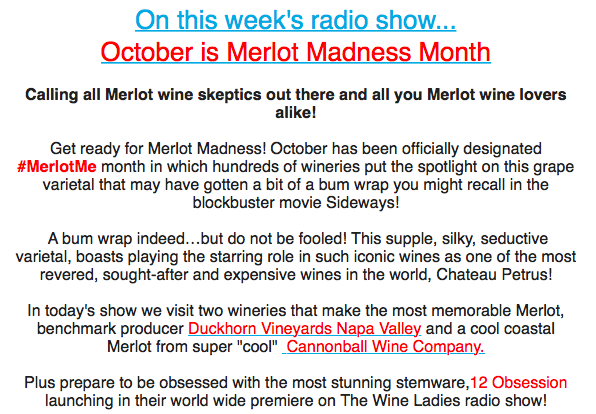 Get ready for Merlot Madness! October has been officially designated #MerlotMe month in which hundreds of wineries put the spotlight on this grape varietal that may have gotten a bit of a bum wrap you might recall in the blockbuster movie Sideways! A bum wrap indeed but do not be fooled! 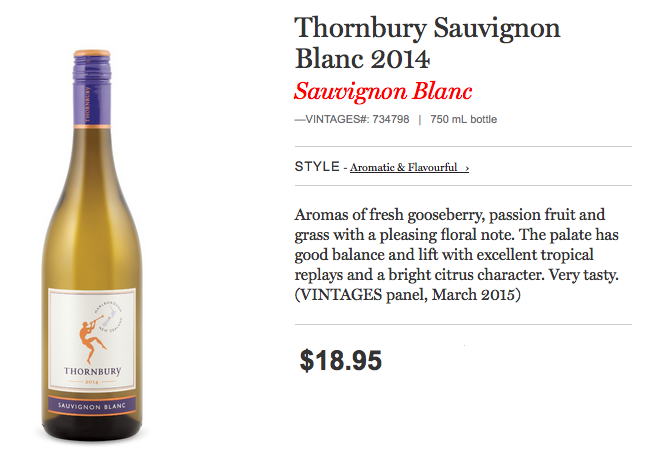 This supple, silky, seductive varietal, boasts playing the starring role in many iconic wines. As one of the most revered, sought-after and expensive wines in the world, Chateau Petrus! 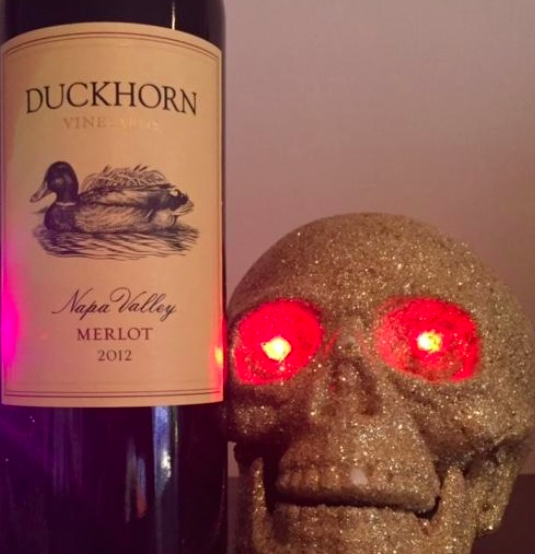 In today’s show we visit two wineries that make the most memorable Merlot, benchmark producer Duckhorn Vineyards Napa Valley and a cool coastal Merlot from super “cool” Cannonball Wine Company. 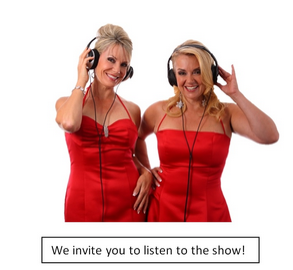 Plus prepare to be obsessed with the most stunning stemware, 12 Obsession launching in their world wide premiere on The Wine Ladies radio show! 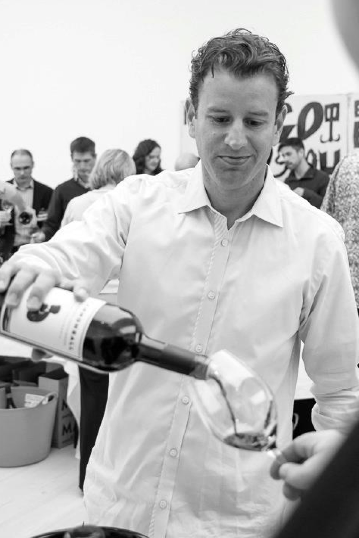 We welcome from Sonoma County, the Founder and CEO of Cannonball Wine Company, Yoav Gilat to the show, making his first splash in 2006, when the company was founded. When’s the last time you enjoyed a Cannonball, Cab or Merlot? Please see all current Cannonball offerings. https://www.thewineladies.com/wp-content/uploads/2015/10/images_Cannonballlogo.png 500 384 Susanne Seelig-Mense https://www.thewineladies.com/wp-content/uploads/2017/08/WineLadiesLogoTransparent.png Susanne Seelig-Mense2015-10-27 16:31:262018-05-30 08:54:56Cannonball Wine Company makes a big splash with their 2012 Cannonball Merlot! A bum wrap indeed…but do not be fooled! This supple, silky, seductive varietal, boasts playing the starring role in such iconic wines as one of the most revered, sought-after and expensive wines in the world, Chateau Petrus! Plus prepare to be obsessed with the most stunning stemware,12 Obsession launching in their world wide premiere on The Wine Ladies radio show! 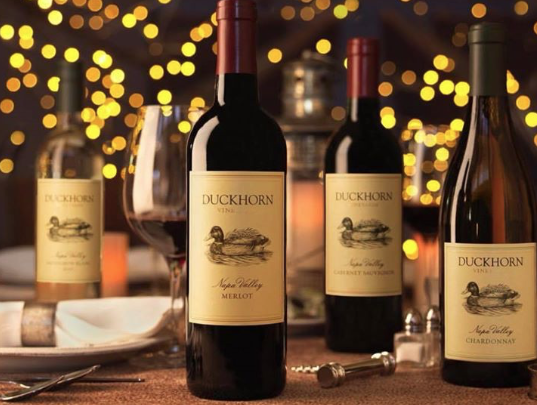 Duckhorn does it best! 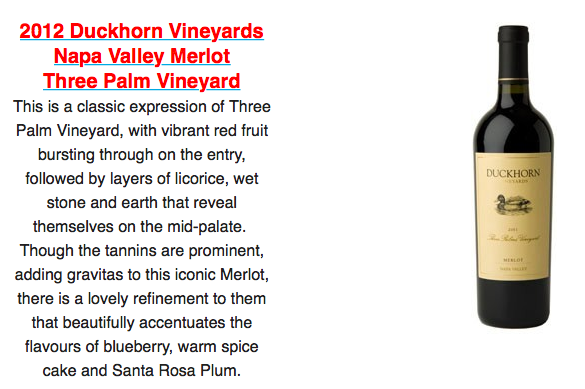 It is a grape that can and does produce outstanding, delicious, coveted wines such as the one we will open up our show with today, a Merlot served at Presidents inaugurations.This Merlot is the benchmark Merlot for Napa Valley and California, and the company is Duckhorn Vineyards. 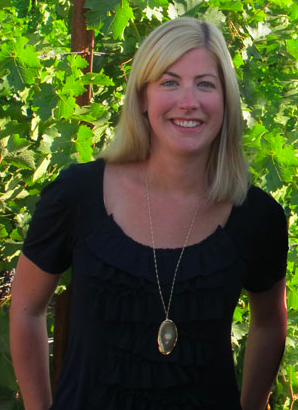 Duckhorn Vineyards is actually the initiator of this month long #MerlotMe international spotlight on the varietal, started a few years back…and we’re going to begin by welcoming Renée Ary, the winemaker at Duckhorn to fill us in on her award winning Merlots, as well as give us more info on Merlot Madness! WIN Stunning Stemware from 12 Obsession Value $300.00. Easy as 1-2-3!!! Click here for contest details! Obsessed with creating exquisite stemware that unleashes the full potential of every glass of wine, our hand-blown and lead-free crystal stands apart with bold & voluptuous proportions and distinctive designs. Designed for couples who truly want to express themselves in an intimate evening of wine and passion,12 Obsession is the the perfect glass to help set the mood and highlight any romantic occasion. Our larger-than-life collection of fine crystal is the extravagant choice for couples having a passion for wine, living large, and the extraordinary. It’s as easy as 1-2-3 to win!!!!! Each prize includes two pairs of 12 Obsession stemware. Whether you are crazy for Chianti or Bordeaux is your thing, Sauvignon Blanc sparkles your palate or Whiskey rocks your world, 12 Obsession has a stunning glass for you! Your choice of 2 pairs of 12 Obsession stemware can be yours. Click here for all 12 Obsession styles available. Tweet #TWL12ObsessionWIN and re-tweet as often as you like! Two winners will be picked at random. Below is an example that you can use and modify as you see fit. @TheWineLadies I’m obsessed to #WIN $300.00 #stemware @12Obsession #TWL12ObsessionWIN Enter me! @TheWineLadies @12Obsession #wine #contest #TWL12ObsessionWIN Pick me please! 3.Each time you tweet (or re-tweet our Tweets) using the hash tag #TWL12ObsessionWIN your name will be entered into our draw for a chance to win the prizes. Keep entering as often as you like. Be sure to add @TheWineLadies at the end of your Tweet as well to help track it. 4. 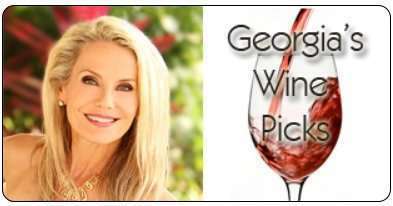 If you don’t TWEET you can also enter on The Wine Ladies FACEBOOK Fan page too right here. The winner will be randomly selected at noon on Monday, November 9th,2015 and will be notified via TWITTER and FACEBOOK. And finally to close off the show we are very excited to share with you a newly launched absolutely stunning line of stemware, called 12 Obsession… unique, gloriously beautiful, hand glass blown crystal masterly crafted. We’ll chat with Founder and CEO John D’Addario of Veritas Crystal about the history and the art of this artisanal craft and learn more about 12 Obsession. 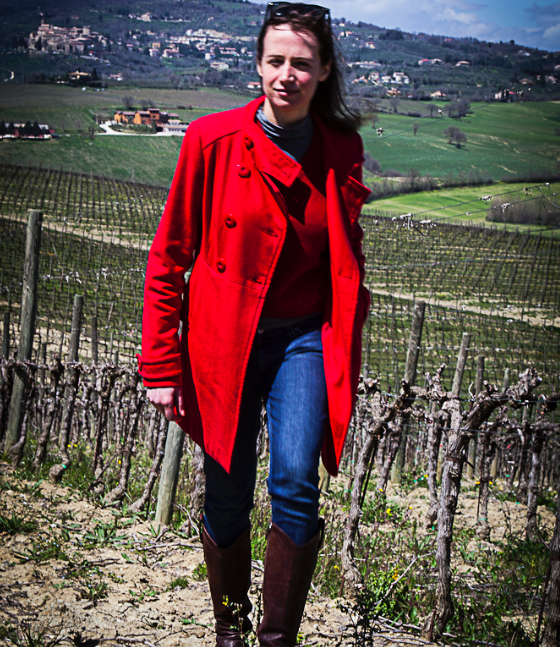 https://www.thewineladies.com/wp-content/uploads/2015/10/images_blurredbordeauxsupertuscan.jpg 1744 1896 Susanne Seelig-Mense https://www.thewineladies.com/wp-content/uploads/2017/08/WineLadiesLogoTransparent.png Susanne Seelig-Mense2015-10-25 13:01:232018-03-21 14:59:42WIN Stunning Stemware from 12 Obsession Value $300.00. Easy as 1-2-3!!! Click here for contest details! The winery’s name translates literally to “one who casts out the devils”. 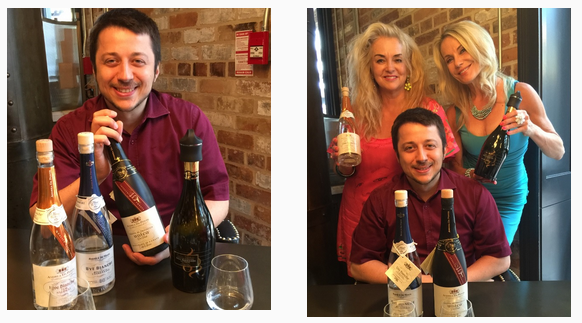 We feature a fabulous premium Prosecco, the signature Italian spirit, Grappa and an Italian wine producer Cantina Scacciadiavoli from the region of Umbria with a devilish story and great wines. 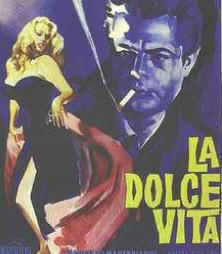 So from the northeast region of Veneto we will move to central Italy and to the region of Umbria. Considered “the green heart of Italy” the only region in Italy that doesn’t border either a sea or another country. We will introduce you to a winery, located in Umbria, who has a fascinating origin and history. Producing wines scoring north of 90, the winery’s name translates literally to “one who casts out the devils”. The winery is Cantina Scacciadiavoli. We’ll welcome Liu Pambuffetti calling in from the winery to fill us in on this devilishly delicious and historical wine producer. is a dry wine that presents a range of vivacious scents, both in the aroma and the taste. Sweet fruit, white and yellow flowers, with a fresh acidity keep the wine alive and persistent. 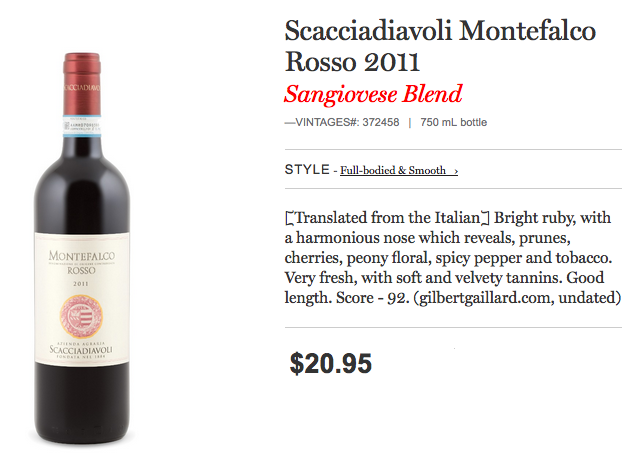 This native Umbrian varietal is vinified in the Scacciadiavoli. At the right temperature it is the perfect accompaniment during hot summer days, as well as all year long with soups and pastas, or light main courses. Wines imported via Lamprecht International Ltd.
https://www.thewineladies.com/wp-content/uploads/2015/10/images_Scaccciadiavoli.png 269 646 Susanne Seelig-Mense https://www.thewineladies.com/wp-content/uploads/2017/08/WineLadiesLogoTransparent.png Susanne Seelig-Mense2015-10-21 11:31:472018-03-29 16:04:08Cantina Scacciadiavoli of Umbria a devlish story and great wines. 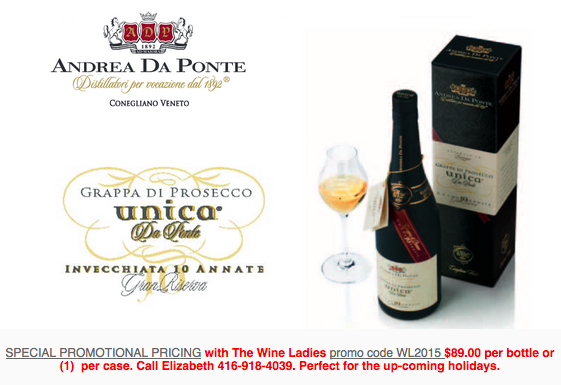 We feature a fabulous premium Prosecco from Andrea da Ponte. The signature Italian spirit, Grappa and an Italian wine producer Cantina Scacciadiavoli. This wine from the region of Umbria with a devilish story and great wines. To get things started we are going to kick off the show with a little bubbly. 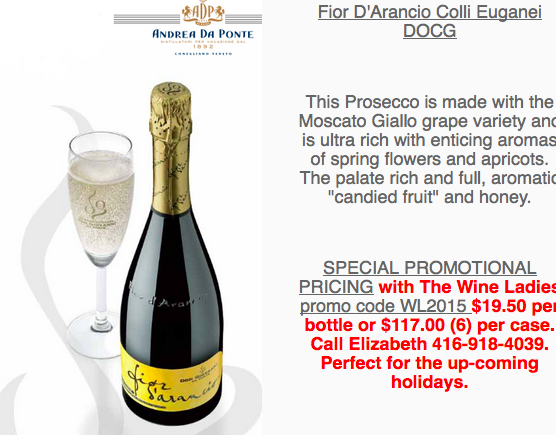 This is no ordinary bubbly, this Prosecco from Veneto of course, hails from the DOCG region of Conegliano-Valdobbiadene. It is made from the finest premium grapes and is produced by the long established award winning house of Andrea Da Ponte, founded in 1892. And from there,this dynasty of a company Andrea Da Ponte Distillery, actually started out over 120 years ago as a distillery. Brothers Andrea and Matteo, were so dedicated to the art and science of producing the finest distillate, that they wrote and published the first printed manual ever on the subject. Historical figures, now producing among the finest grappa in the world…Christian to fill us in on the Andrea Da Ponte grappas, what makes them so unique and outstanding! Listen to Christian Kokkinomagoulos at 7:00 minutes into the show. Recently at our fundraiser for Dancing with Mississauga Stars at Parsons Interiors. 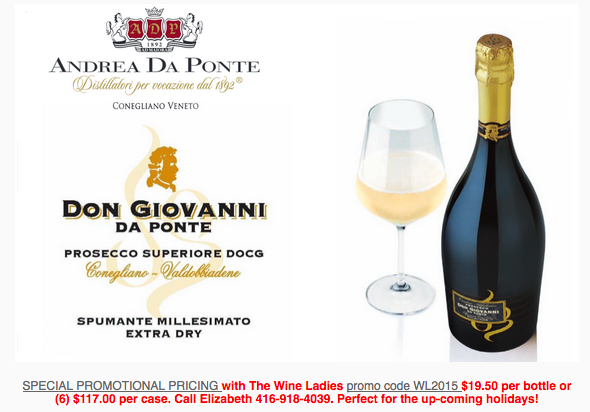 Thank-you to Elizabeth Wright owner of Cottonwood Wine Agency for her support and pouring of premium Don Giovanni Da Ponte Prosecco and Andrea Da Ponte Grappa. Ask The Wine Ladies…Is Prosecco a grape or a place? 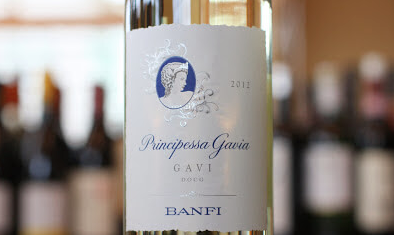 Principessa Gavia Gavi by Banfi 2014, Georgia’s Wine Pick. 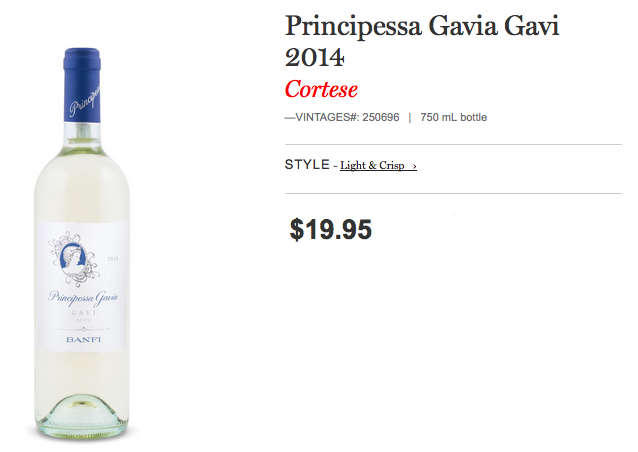 So here is my find for today, I was in the mood for something light, fresh, and a little different, strolling through the aisles of our LCBO, and I picked up this Italian white that turned out to be exactly what I was looking for. In fact, I’ve since been back a couple of times to pick up another bottle! It comes from the DOCG region of Gavi, located in the prominent wine region of Piedmont and is made from the indigenous grape variety Cortese, 100%. 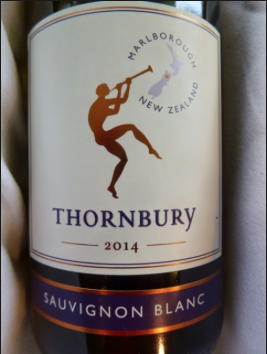 In this particular wine the grapes are sourced from the producers own estate grown grapes. https://www.thewineladies.com/wp-content/uploads/2015/10/images_Banfiwinery.png 246 622 Susanne Seelig-Mense https://www.thewineladies.com/wp-content/uploads/2017/08/WineLadiesLogoTransparent.png Susanne Seelig-Mense2015-10-08 18:19:302018-05-03 16:07:04Principessa Gavia Gavi by Banfi 2014, Georgia's Wine Pick. Winemaker and Proprietor Walter Schmoranz of the award winning Pelee Island Winery. 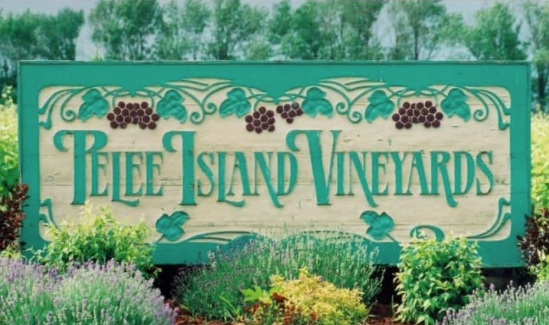 And finally to close off the show, we head to the most southerly point in Canada and most southerly vineyards, that is the beautiful Pelee Island and Pelee Island Winery. To explore this island, this true gem of nature, all it has to offer and the wonderful wines that come out of this stunning region. 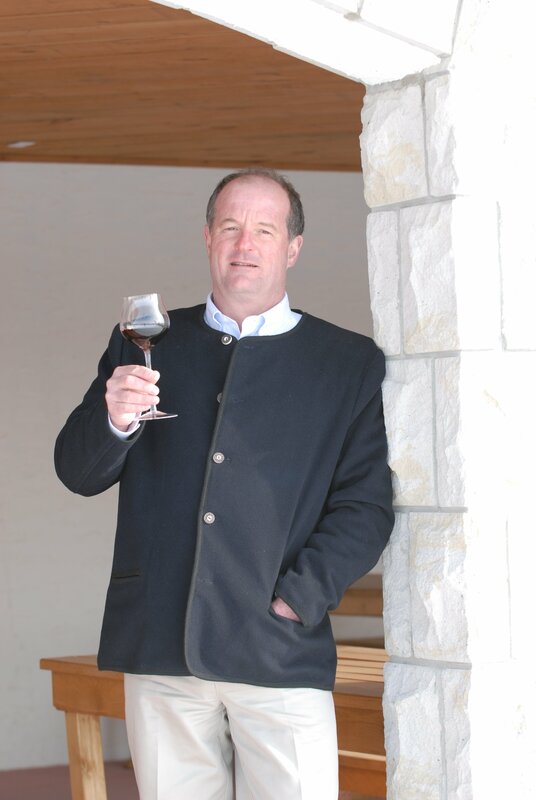 We’ll welcome to the show Winemaker and Proprietor Walter Schmoranz of the award winning Pelee Island Winery. 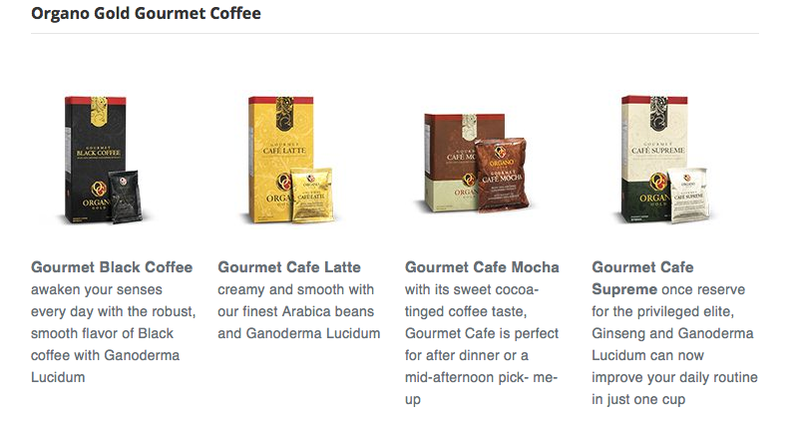 https://www.thewineladies.com/wp-content/uploads/2015/10/Screen-Shot-2018-03-30-at-9.59.06-AM.png 325 549 Susanne Seelig-Mense https://www.thewineladies.com/wp-content/uploads/2017/08/WineLadiesLogoTransparent.png Susanne Seelig-Mense2015-10-04 12:33:562018-03-30 10:33:40Award Winning Pelee Island Winery, Canada's most southerly vineyards. Make your own wine, ready in time for the holidays with National Wines U-Brew of Oakville. 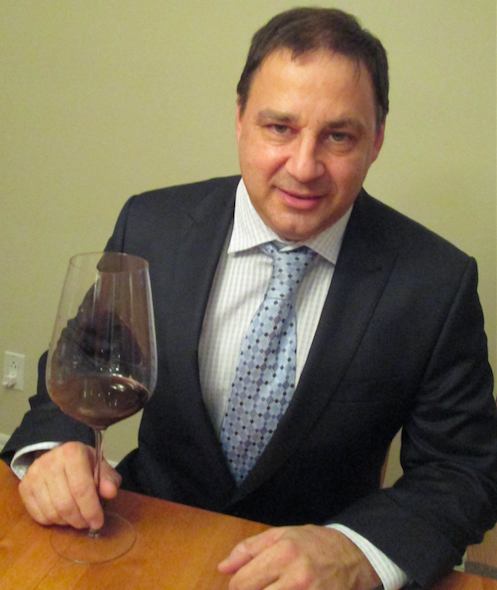 Anthony Reis of National Wines U-Brew in Oakville. No it’s not too soon to be thinking about the holidays if you make your own wine and want to have it ready in time! Our next guest is the proprietor of National Wines U-Brew, a full service wine making facility located in Oakville, Ontario, voted #1 year after year. 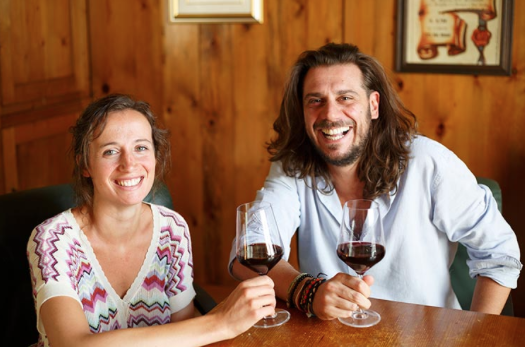 Anthony Reis will join us to share his knowledge, and experience on what it takes to make premium quality home made wine! As award winning winemakers often say “it starts in the vineyards with the grapes” and Anthony will concur providing fresh premium grapes from around the world, including our own backyard Niagara. WIN one of Two Grape Escape Wine Tours to Niagara! Value $1000.00. Discover Washington wines. Make your own wine in time for the holidays. 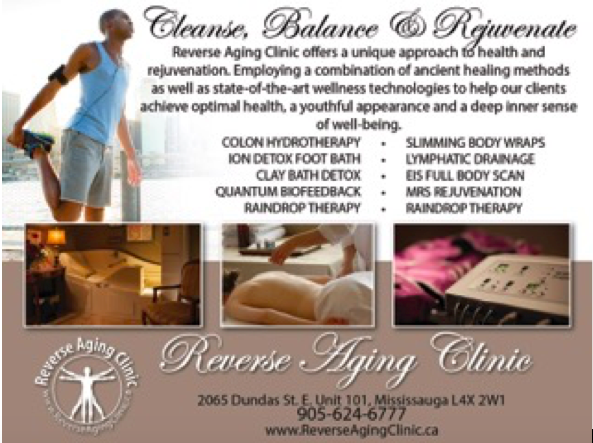 Discover the secret anti aging ingredient and Canada’s most southerly wine region Pelee Island and Pelee Island Winery. We are located in the heart of Oakville. Our Wine Making facility is frequented by the most discerning wine making enthusiast. Specializing in TOP QUALITY PREMIUM WINEMAKING PRODUCTS, and FRESH PREMIUM JUICES. Now introducing award winning WINE KITS, from Mosti Mondiale. We also import FRESH QUALITY GRAPES (PIA BRAND) in season, for the traditional wine maker, as well as all wine making accessories, and supplies. Our FERMENT ON PREMISE facility is user friendly. JUST COME IN, SELECT YOUR PREMIUM FRESH JUICE, AND RETURN IN 7/9 WEEKS TO BOTTLE YOUR PREMIUM WINE. We are the sole distributor of Mosti Mondiale products in Oakville. Come and visit us, and make your best wine ever!! 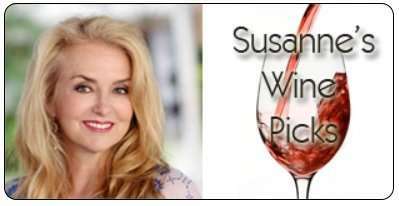 https://www.thewineladies.com/wp-content/uploads/2015/10/images_Nationalwineslogo.png 137 435 Susanne Seelig-Mense https://www.thewineladies.com/wp-content/uploads/2017/08/WineLadiesLogoTransparent.png Susanne Seelig-Mense2015-10-02 17:14:062018-03-30 11:17:39Make your own wine, ready in time for the holidays with National Wines U-Brew of Oakville.